Table For Three, Please. 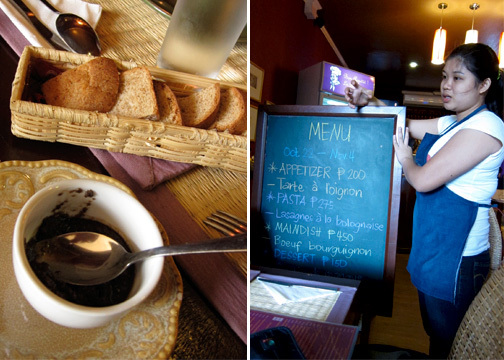 » Davao Eats: Bon Appetit! In a recent trip to Davao a friend brought me to this place one afternoon for merienda. It was a charming nook. 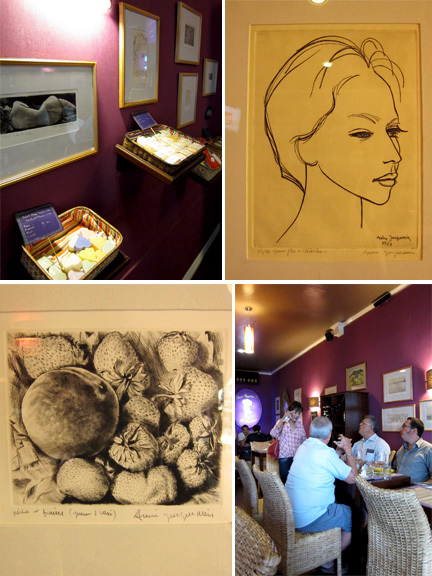 A quirky little French bistro with plum colored walls filled with these beautiful engravings and curious goods (scented soap, cans of pate) for sale. I liked the contemporary wicker furniture and the dim, diffused lighting; the feel of that place was simple and homey yet still very tasteful. I liked that a lot. 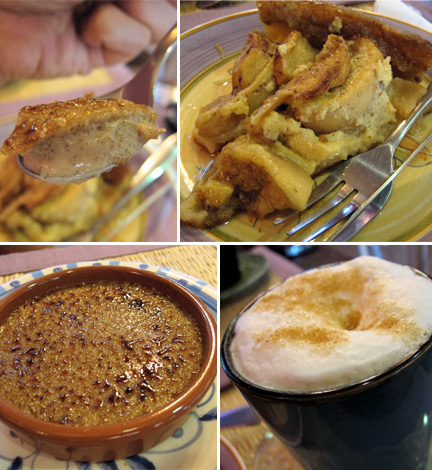 We had ordered a Creme Brulee and a Tarte aux Pomme together with some coffees. My cafe latte looked great but turned out to be watery. And their version of Creme Brulee, which was a bit grainy and scented with lots of cinnamon, was not my favorite. But their apple pie was divine. Large, finger sized wedges of apples bordering between firm and jelly-like atop a really buttery crust. The sweetness came mostly from the fruit. They had a lot of French bistro classics on the menu (Soupe a l’Oignon, Salad Nicoise, Magret de Canard, Entrecote de Boeuf) but they also had specials written on a blackboard which they changed every two weeks. I had seen a tray of Lasagna a la Bolognese being taken out from the kitchen, not quite French, I know; but it looked to die for. So my friend and I were in agreement that we had to come back for lunch the following day. The day after, my friend and I decide to stick mostly to the specials; ordering the Tarte a l’Oignon and Boeuf Bourguignon. It was difficult to resist double-taking on the waitress as she spoke Bisaya with flashes of fluent French. (“Bourguignon” just rolled of her tongue.) 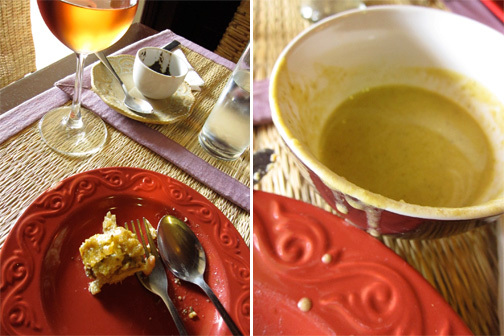 We also place an order for the Soupe de Legumes Frais. And a Croque-Madame for good measure. Unfortunately they didn’t have any bread for the day for my Croque but I guess that was divine intervention as the food came in large portions. The soup came first and it was probably good for three or four. 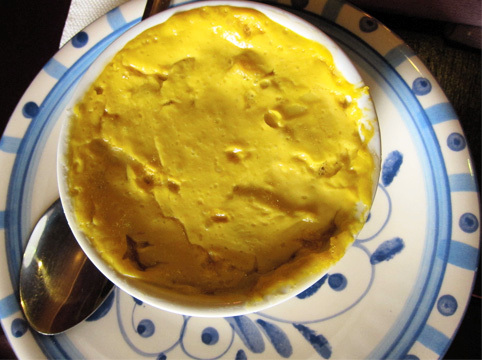 It tasted of fresh asparagus; thickened with potatoes and enriched with cream. A great starter and of great value at P150. Something like this would probably cost P150 per bowl here in Manila. 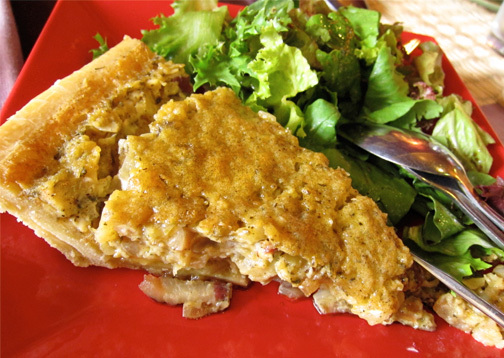 The onion tart was a generous 8 inch slice with a simple salad of mesclun and olive oil. I loved this one. It was served warm and the the filling was just rich and velvety; with sweetness coming from caramelized onions and salty bites from crisp fried lardons. The crust was, again, buttery and flaky. 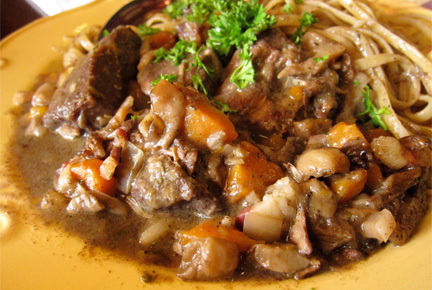 The Boeuf Bourguignon came in a huge, overflowing plate with sauce drenched fettuccine. I thought it looked a little pale but all doubts were erased upon first bite. Clearly the meat had been properly marinated in wine for a few days because of it’s even, rosy hue and the flavor of thyme just penetrated every fiber of the meat. It was hearty and just sticks to your ribs. Rosalie, the gracious owner, sent us a Gratin de Mangue (mango gratin) for dessert as she found out we had been here the day before. It was served cold and taste like a crepe samurai, actually. Layers upon layers of mango and mango flavored cream. 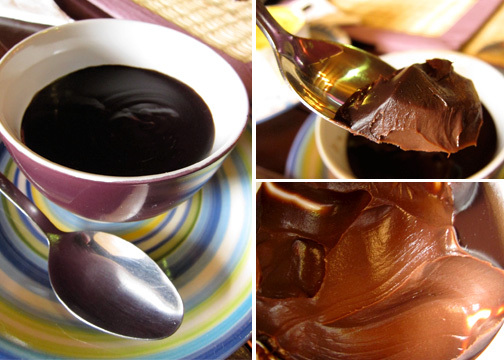 What blew our minds was this innocuous looking Pot du Creme au Chocolat. It just looked like this inert black puddle sitting in a ceramic bowl. But all preemptive judgements were thrown out the window shortly thereafter. You had to hold on to the vessel when spooning out because of its density; almost to the point of being fudgy. It had that luxuriously velvety mouthfeel and that deep bittersweet chocolate flavor. Just my type of dessert. A dollop of Chantilly cream would’ve been a great one-up. Again, I was pleasantly surprised to stumble upon other food finds in Davao aside from TUS (the usual sinugba). For some reason I don’t know why fate drives me to these independent French-run operations, but I’m not one to complain. There is an expanding list of places I plan to try out next time I’m in Davao, but I definitely will be back at Bon Appetit. *The fabulous artwork on the walls were made by chef-owner Yves Monestier’s grandfather, Andre Jacquemin; whose popularity and body of work dates back to the turn of the century. The etchings and engravings are all numbered and are for sale. For what they are I thought they were fairly priced. The prints alone are worth the visit for Francophiles out there. That Pot du Creme looks really good. I suddenly want to take a trip to Davao just for that. like spooning nutella... I'm curious what the new specials are.